Champion Taekwondo offers a one week trial for anyone interested in our program. The cost is $20 and it includes 3 classes and a beginner uniform. Be sure the beginner (green shaded) class times will work for you. Students are expected to attend 2-3 classes per week. You don’t need to select the class times in advance. Once you are a member you can attend any level appropriate times. Consistent attendance is a must. We understand that family schedules can be tricky to coordinate though, and keeping the schedule flexible and simple is a priority. Once you decide on the first class time you can register for the trial online or in person at the studio. You don’t need an appointment, new students are welcome in any beginner classes. Arriving 10 minutes before class will give you enough time to register and change. We have all uniform sizes in stock in the studio office and a quick info form to fill out. The front or back lobby have registration forms and an instructor will get you sized and show you to the dressing rooms. Champion Taekwondo is a no contract studio. You can cancel any program with written notice. Services are prepaid and there are no refunds, but can be transferred to another family member or credited toward future use. What does a membership cost if I like it? The membership cost can be emailed upon request or a printed copy can be picked up in the front lobby of the studio. Yes. There is a family discount of 20% per member. My daughter was in martial arts before we moved here. Will she have to start over? Students with experience are welcome! There are different situations which will need to be evaluated on a per case basis. 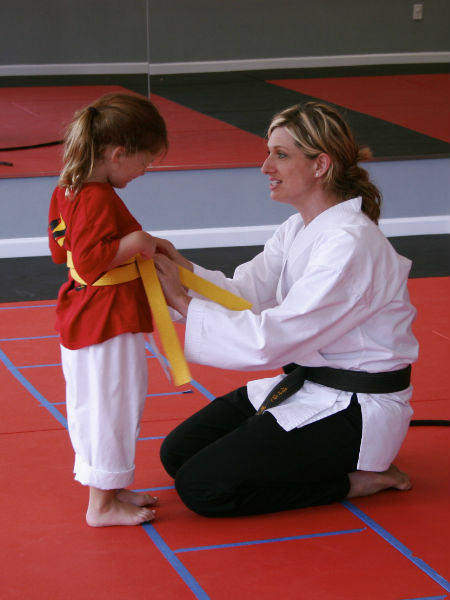 Instruction and curriculum can vary even within the same style of Taekwondo. Rank earned from other studios is recognized, and any recommendation from prior instructors is encouraged. The trial classes would be a time to find which belt level at Champion Taekwondo is the closest match to the curriculum of their current belt level. The only case where someone would be asked to start over is if there has been a long gap since practicing consistently. How do I sign up once my trial is over? You can enroll online or in the studio office. My neighbor goes to a Taekwondo studio where his son was invited to be in their “Leadership Program.” Do you offer that? Every student enrolled here gets leadership training. There will never be an “up-sell” program or special class where you would be asked to pay for these types of benefits. Can I watch a class before I try one? If you want to drop in and watch you are welcome any time. If you are curious about what classes are like, take a moment to talk with some of the other people watching. They will be happy to tell you how their experience has been with the program. Which lobby should I use and where should I wait? The studio has two entrances. Market Street in Baxter can get busy in the evenings so there is limited parking by the front entrance. There is a large lot directly behind the building. The awning by the back door is marked Champion Taekwondo and is used as an alternate entrance. There are two lobby areas, one by the front door which is open and one by the back door that is enclosed but has large windows for viewing class. Where you choose to enter and watch class is based on personal preference. What should I wear under the uniform? Do I need to return it if I don’t sign up? Most people find that a fitted, sweat wicking base layer is most comfortable. The trial includes a beginner uniform and white belt. They are yours to keep. I see people wearing tee shirts and different types of uniforms. Where do I get those? These are available for purchase in the studio office. Some of the shirts are earned for participation in service programs, an instructor can tell you how you can get involved.